If you could go back to 2006, you’d find yourself smack dab in the middle of the talking animal computer generated feature film era. Blue Sky was riding high on the Ice Age films, DreamWorks had Madagascar & Over the Hedge, Sony had Open Season and even Disney wanted in with The Wild. Nickelodeon/ Paramount Pictures wanted in on the action and that leads us to Barnyard- The Original Party Animals. I suppose the only way to begin this review is to come out with the cold hard facts- compiling all of the major critical reviews of this piece around the web results in a very underwhelming 2-star average. Naturally this would lead you to suspect the film is an absolute abomination when in fact it’s not nearly as bad as many CG features on the market these days (namely those foreign films that are dubbed in English and dropped on our doorstep as something new). 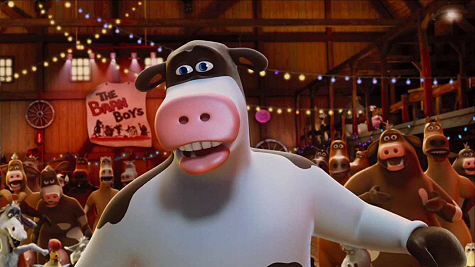 In fact, the film was considered successful enough for Nickelodeon to warrant 52-episodes of the spin-off series Back at the Barnyard (2007-2011). It should also be noted that while it faired poorly with critics, it was considered quite a success financially having cost less than $51-million to produce but raking in over $116.5 million worldwide. The film comes in at a runtime of 90 minutes and wears an appropriate PG rating due to some comic peril, cartoony violence and the usual mischief one would expect from Nickelodeon. The concept here works on the principle that when the kind-hearted vegan farmer goes to bed at night, the docile barnyard turns into a full fledge society onto itself with animals popping up on their hind legs, talking, singing, dancing and in many cases, causing extreme mischief (let’s just say they bring a new definition to the concept of grand theft auto before this one’s over). The film follows Ben (Sam Elliot), a broad shouldered, soft spoken bull (oddly enough with a big ol plunger-looking udder) attempting to teach his son Otis (Kevin James) the responsibility that comes with guarding the barnyard from threats like coyote. Otis, however, is busy surrounding himself with other party animals; goofing off, dancing and essentially being Kevin James. It’s much publicized but still worth mentioning- all of the male cows have utters for whatever reason here. You identify females by a bow on their head. Biology teachers the world over must love this one. Anyway, along the way there are a surprising number of song and dance routines, not the least of which include James (Otis) belting out a number of his own and some involving an odd living hairball who occasionally pops out of a crate to turn the entire barn into a techno dancehall. Amidst all that partying enters Daisy (Courtney Cox), a pregnant refugee cow who apparently lost her husband to a storm to serve as Otis’ love interest. When Ben meets his match attempting to defend the farm from a marauding band of coyotes led by Dag (David Koechner), Otis suddenly finds himself inheriting his father’s responsibility whether he’s ready for it or not. And I’ll give you a hint- he’s not. About the biggest problem here stems from the fact that any laughter comes from the movie’s absurdity and not its comedy or cleverness (despite some genuinely funny set ups like the neurotic neighbor lady and her cynical beer swilling husband). Kids will surely delight in the endless silliness and on-screen gags aplenty but the adults are going to have to trudge along without the benefit of some nice Pixar or DreamWorks layered depth. Visually the film wasn’t exactly cutting edge, even back in 06 with a style that’s eerily reminiscent of Jim Davis’ comic strip US Acres. The textures are colorful and crisp however even of the character models maintain a certain degree of pudgy “roundness”. 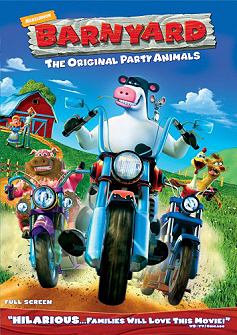 In all, Barnyard has lived up to the expectations of many by essentially fading into oblivion in the highly competitive industry that is the CG-animated film business but that’s not to say it doesn’t have a bit of charm should you or yours find it in a discount bin while getting groceries. When you think of the heavy hitters in the animated feature film realm, it’s certainly understandable if the first things that come to mind are Disney, Pixar or DreamWorks. However Nickelodeon has been hovering around the scene for a while now, hoping to earn a nice piece of the CG animated movie pie. Rango is by far their most serious attempt and while the film’s deserved PG-13 rating may succeed at distancing it from its key demographic (a concept all studios would be wise to emulate from industry-leader Pixar). 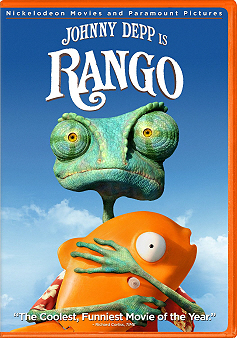 The story follows the comical, transformative journey of Rango (Depp), a sheltered chameleon living as an ordinary family pet, while facing a major identity crisis. After all, how high can you aim when your whole purpose in life is to blend in? When Rango accidentally winds up in the gritty, gun-slinging town of Dirt, a lawless outpost populated by the desert’s wiliest whimsical creatures, the less-than-courageous lizard suddenly finds that he’s been preparing for this role his whole life. Welcomed as the last hope the whole town has been awaiting, the newly appointed Sheriff Rango is forced to play his new role as if it life depended on it. In fact, it does! 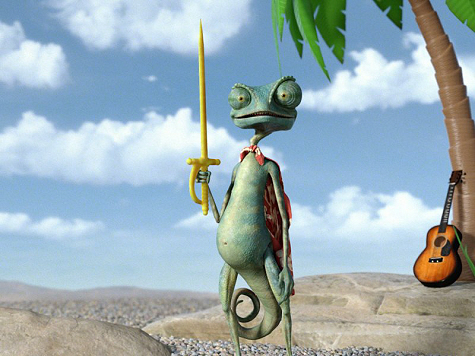 In a blaze of action-packed situations and encounters with outrageous characters, Rango starts to become the hero he’s always pretended to be. If you didn’t already know, this piece represents Gore Verbinski’s first film since concluding his Pirates of the Caribbean trilogy in 2007 and represented an ideal opportunity for him to continue working with the oddly charismatic Johnny Depp. Like the Pirates trilogy, Verbinski proves strangely proficient at developing properties that seem almost kid-friendly but continually flirt with adult-only ideals and references. In fact those viewers expecting a wild-west themed variation of a typical Disney/ Pixar feature will be in for a bit of rude awakening. Rather than craft an action-driven kids movie peppered with adult humor and pop culture references, Rango is boldly unrepentant for the various tones and complexities it explores. Industrial Light and Magic does a spectacular job with the look of the film, with drab landscapes and gritty character textures and while the John Logan script is funny at times, appreciation of this film depends heavily on the viewer’s feeling towards old spaghetti westerns. The pacing is deliberately drawn out and littered with crusty townsfolk, children will likely find the prose a bit too dull to hold their interest even before the objectionable language and references have a chance to upset them. In fact, a strong argument could be made that this is very nearly like watching a genuine old western film with personified animals transplanted over black and white live action sequences. Further contributing to the sensation is an extended version release on the DVD & Blu-Ray that comes in at just under two-hours. I personally enjoyed the idea of a desert down finding so much value in water that it has literally become currency and there’s no denying that, while a bit hideous, there is some serious brilliance in the character design models. Of course despite the film’s rambling philosophies and lackluster supporting characters, Rango has its moments thanks in no small part to solid vocal deliveries from Depp, Ned Beatty, and Wedding Crashers’ Isla Fisher. There are some slapstick moments to keep the kiddies in their seats even if the western puns and clichés will be lost upon them. Adults may get a kick out of a few of the exchanges although truthfully, they can be a bit over the top, eliciting some “ewwws” even out of teens at times. 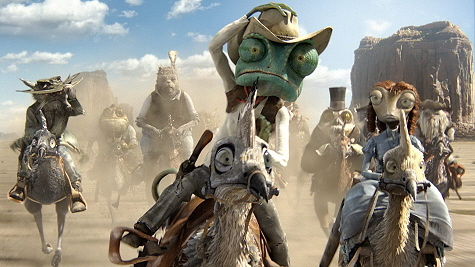 In conclusion some of the finest computer generated visuals to date (there is a segment depicting a human that is nearly photo-realistic), Rango lacks the type of undeniable cleverness that makes many of Pixar and DreamWorks’ pieces so timeless. Adults who appreciate modern animation (especially those with a fondness for western classics) will find much to enjoy here but contrary to the Nickelodeon backing, kids aren’t the target audience for this one.